Ali Morrisane (yes, the same Ali that opened a Magic Carpet service) would like to start his own Rune business, but first he needs your help in opening his casket! For helping him, you'll be able to buy Runes at a lower price, and other items will be available to you as well! Speak to Ali in Northern Al Kharid near the gem stall and ask him how business is doing. He will tell you that he wants to restock on new supplies, such as Blackjacks from Pollnivneach, Clothes in Sophanem and Runes from Varrock. Note: Blackjacks and Clothing have a special supply/buy process different than the Runes. There are 2 types of stocks per type of items, except for the Runes. Each time you go see the suppliers, they will switch those types. Head to the Rune Store in Varrock and tell Aubury about Ali Morrisane. Tell him that he is trustworthy, and he will agree to supply his stall with runes. Now walk or teleport back to Ali, and try to buy his Runes. He will say that the chests are locked. First try to pick lock the small chest. At level 53 Thieving, I managed this easily. Congratulations, now Ali sells Elemental Runes! This puzzle is like the game "Sudoku". 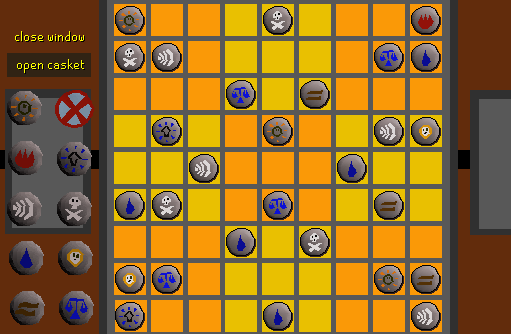 You can only have one type of Rune on each row and column, and you must fill up the grid with runes. Then, visit the Sudoku Puzzle Solver and type in what you see, leaving the gaps. So for example, if my puzzle was Earth (blank) Law, I would put in 1 (blank) 9. Do this for all of the Runes, and then click Solve in the solver. Then, fill in the missing gaps on the grid. If you make a mistake, use the red cross to delete a Rune. Congratulations, you now have access to his other shop! And you won't need to mess with the chests again, as the Rune stores restock themselves! The Blackjack Merchant can be found near the Kebab Shop. Convince him that his Blackjacks are weak by getting bashed twice without being knocked out. You'll get some Attack Blackjacks and some regular Blackjacks. Now let the Urchin steal his stock by paying 100 coins and doing a diversion to get Defensive Blackjacks. Note: Remember that Ali cannot sell both stocks at the same time, and you will need to swap between them. Siamun is inside the weaver's shop in Sophanem, and he provides the Cloths for Ali. First of, he wants supplies for what he gives. He first starts with Menaphite Clothing. He wants 3 dyes of the same color for Menaphite Clothing, or 3 animal skins of the same type for the Desert Clothing (Wool, Cowhide, Snakehide, Wolf Fur). Congratulations, you've completed the Activity! You now have access to the Rune store which sells cheaper Runes, the ability to buy new Desert clothes and new Blackjacks.